Here lies an archaeologist's dream, but one would pass it without noticing. A little more south of Jaffa Gate is a hole in the city wall round Jerusalem's Old City. A sign above a building shed announces a project of the Jerusalem Foundation and building company, Avner Gilad, from Naharia. In the background, the towers of the Citadel, or Museum The Tower of David. Inside the wall, a dusty trail and an iron staircase lead to the entrance of a 19th century building, what was once the kishle or winter barracks for the Turkish soldiers during the Ottoman rule. Inside, lamps ensure a good view on the vertiginous dig. In the 150 feet long rectangular building, it looks like an impossible ski slope or a place where it is easy to commit a murder, with some gruesome deep pits. The facades are still standing, and the roof has been left undisturbed. The kishle was later used as prison, by the Turks, British and the Jordanians. On the east side there are barred windows, and on the wall are the prisoners' graffiti in English, Arabic and Hebrew. Muhammed Hawwa, construction manager, and Jon Seligman, chief archaeologist of the Antiquities Authority (IAA) in Jerusalem, have sure footing over the sandbags along the conveyor belt that carries stones and rubble outside. The nine meter deep digs have taken one year before they were rounded off at the beginning of September. The digs have a twofold goal; first, building an annex of the museum of the Tower of David, meant for teaching living history to schoolchildren. The second goal was digging up the antiquities. Two floors for the museum are planned, which will come on top of the excavation layers. The lower floor will maybe get a boulevard with a glass floor along the archaeological wonders. Hawwa, short and stocky, from Acco, says that the builders and machinery were employed before in restorations like that of the Crusader castle in Acco. He himself has also worked there, but he thinks the kishle in Jerusalem is the best of all sites. "This is the project of my life," he beams. Although he possesses by now some archaeological skill, he is primarily interested in the maintenance of the antique walls of the building. That is why the Turkish walls were first lain in concrete protections with steal pins, before the digging began. On the bottom of the excavations Hawwa shows the eastern wall from the Byzantine period (324-640 CE). It had to be made watertight, as it will become the outer wall of the new museum. In antique times walls were not closed with species, but in the best cases the stones close seamlessly. The Byzantines were less skillful in this than master builder Herod. Hawwa admits that his company does not treat the walls in the cheapest way - the part that we are standing in front of costs already 3000 dollars - but it is preferable to using putty and have winter rain enter in a few years. Wherever possible Hawwa uses authentic materials. He shows a stick which looks like marble, made of pink pottery shards from Herod's time. Bearded Seligman defines the role of the archaeologist ironically: "We always follow the tractors." Together with a team of builders archaeologists of the IAA have taken on the actual digging. No volunteers this time, because they could fall in a pit. Executor of the project Amit Re'em is in Turkey during the interview so that is why boss Seligman is filling in. It so happens that the kishle occupies a famous location, where once the palace of Herod stood. From the writings of historian Josephus it was known that it bordered south of the Citadel (Museum Tower of David). But any remains of the palace had not been found before. It is the second most important building in Jerusalem, after the Temple, from the time of King Herod (37-4 BCE). Herod inhabited it himself, but not permanently, as he owned more residences in Masada, Herodion and Caesarea. Josephus puts his heart in the description of the "wondrous" palace in The Wars of the Jews. It was larger than the kishle. Book 5, chapter 4 tells of a walled resort, with luxury bedrooms for 100 guests. The vessels were of gold and silver. It was like a garden of Eden; it had numerous porticoes where the inhabitants and guests could breathe fresh air, while white doves sat in their tills. The groves were fed by a network of deep canals and underground cisterns which collected rainwater. The water was tapped from copper statues. The current excavations have disclosed two palace walls. The rubble that filled the space between them was cleared in an area of three square feet, showing the naked rock at a depth of about nine feet. 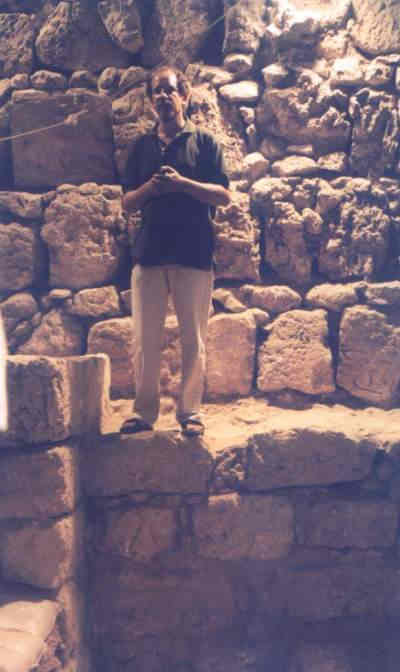 The walls are constructed of the easily-recognizable Herodian hewn giant blocks. They probably did not belong to the palace proper, but were the supporting walls for its base, a similar construction that Herod used at the Temple to even the ground, to raise it and to increase the building area. The rock was already quite high of itself. Josephus describes that too: the Citadel, which protected the palace, and the palace itself, were built on a crest. Earlier excavations in the seventies outside the city wall's wall already disclosed the exit of a water drain belonging to Herod's palace. It transported water from the palace into the Hinnom valley. In the kishle the other end was dug up. The pipe is big enough for humans to creep through. That also happened during the First Jewish War, when Jewish rebels fled the city via the sewers of Herod's palace. The pipe in the kishle could be one of those. The palace was later destroyed, not by the Romans, but by the Jewish rebels. The Roman procurators had taken up the palace as their residence after the conquest of Palestine in the year 6. Decades of strife passed between the Jews and the Romans. After governor Florus had set up a mass crucifixion of innocent Jews, the First Jewish Rebellion broke out in 66. Jews entered and burnt the palace. Only three defense towers remained partly standing. These are still visible in the Tower of David museum. After 70, Titus set up his camp for the Tenth Legion in the area of the palace. It controlled Israel from its Jerusalem base for 200 years. 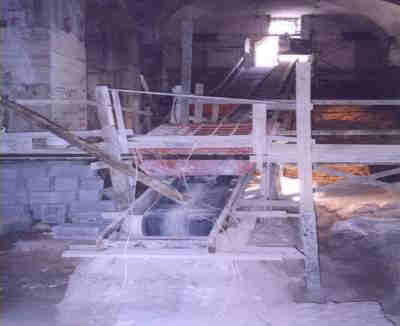 Centuries later, a workshop was erected, possibly of a tanner, in the Middle Ages. Nine plastered basins were excavated. Against the east wall Crusader arches are visible. In the western wall it can been seen that the Crusaders fortified and heightened the 15 feet thick Hasmonean city wall. The Arabs, who conquered Jerusalem after them, did the same. 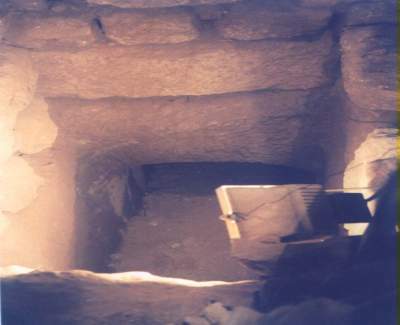 The oldest dig has been left for the end, because there appeared also a late-Israelite wall; of the kings from the Iron Age (until 587 BCE). 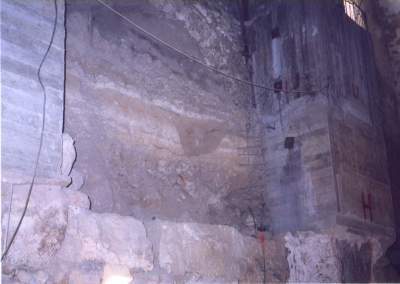 The wall lies well inside the Herodian and Hasmonean walls. The stones (without species!) are a lot smaller than in the Herodian wall, but they still stand fast. The archaeological tour is disturbed when a group of prim-looking ladies and gentlemen step inside. They are the fund-raisers of the Jerusalem Foundation, who are taking a look at the location, to be able to sell it better to donators abroad. The work is lying still at the moment. "We spent all the money on the archaeology," says Alberto Piperno, ex-Roman and director of Planning and Construction of the Foundation, a bit sour. That is why nothing was left to build the museum, which will cost another 1.2 million dollars. Next to the kishle, also on territory of the Tower of David, the museum wants to install an auditorium, but that's a later worry. The female fund-raisers think it scary to climb to the depths of the kishle and whisper excitedly with each other whether they would not rather stay on the middle level and look from there. But, you cannot see the final details from there. A little later they climb on the sandbags. Meanwhile Piperno exchanges the last news with Seligman that they have found a rich English lady who has shown an interest in the project. "Can't we get a coin for the contributor?" asks Piperno. The archaeologist shakes his head. "No." Piperno: "You have found some coins, have you?" Seligman confirms: a gold coin, some silver and bronze, a hoard of copper. Piperno, begging: "It would give such a nice impression to that lady." But Seligman stays firm: "We cannot do that. Believe me, I have received innumerable requests from the American president for coins and shards, but even he does not get anything." Piperno has one further problem. Where should the emergency exit be? On two walls of the building is the police office, on the other side lies the city wall, and the fourth, short side is that of the entrance. On the roof of the kishle, reached by a short walk over the city wall, it can be seen that the police office also obstructs dreams about further archaeology of Herod's palace: where the low buildings are standing round a courtyard with purple bougainvillea, was exactly the location of the king's residence.